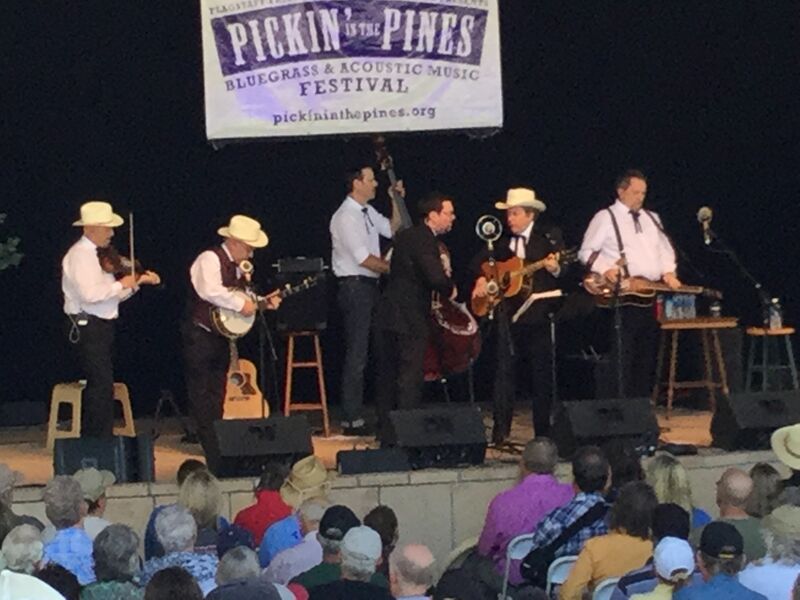 In case you missed it… our Pickin’ in the Pines review. What a wonderful weekend! 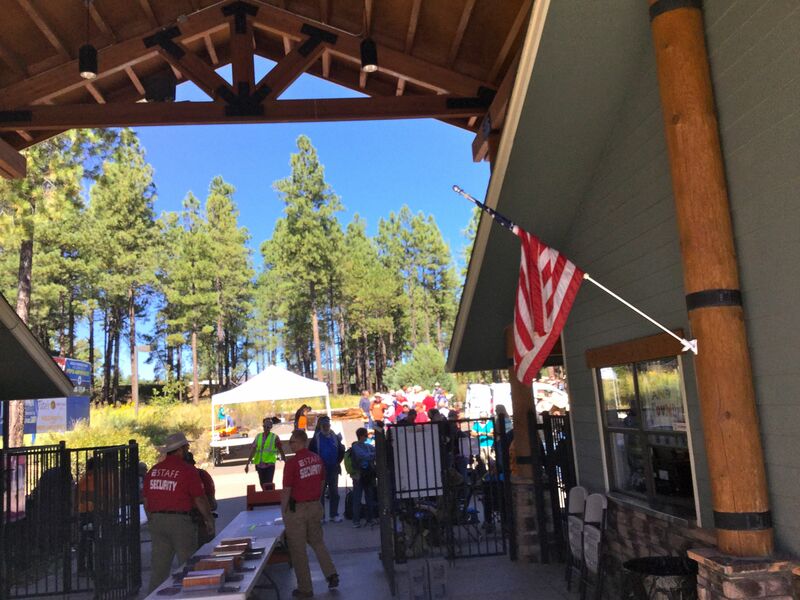 The weekend of September 18-21, Flagstaff hosted Pickin’ in the Pines, an amazing bluegrass festival held at the amphitheater at Fort Tuthill County Park that was about 3 miles from our store. 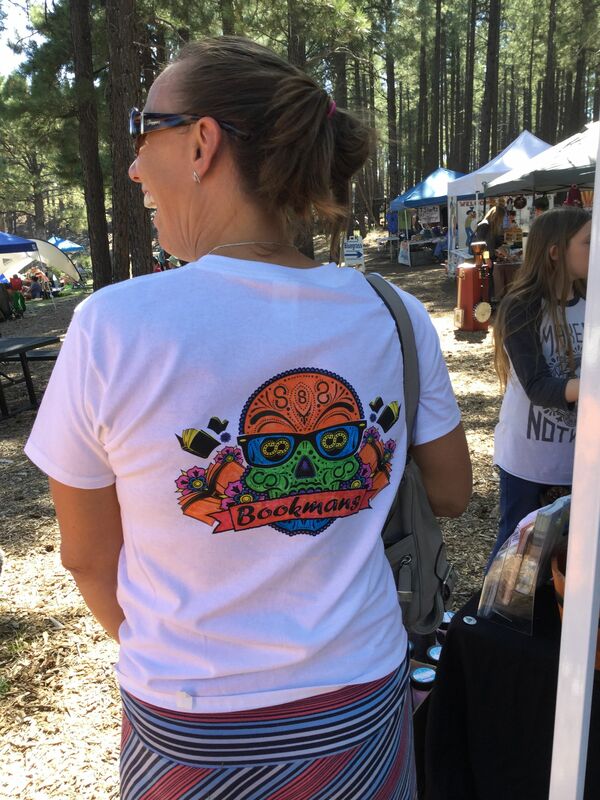 Bookmans was one of the sponsors and vendors at this rip roarin’ event and I along with some of my cohorts got to work our booth and attend this cool event. I was a newbie at Pickin’ and I had no idea what to expect. Usually my idea of festivals are overcrowded outdoor venues with long lines at the bathrooms and the acrid smell of bad beer and body odor. I have to be honest, I had trepidations about attending Pickin’ in the Pines as I wasn’t a bluegrass fan even though I could appreciate the artistry of the music. The most exposure I had to this classic American music was when I went with my family to car shows back East where there were often bluegrass bands pickin away. I enjoyed what I heard but I never felt the need to pursue bluegrass any further. At Pickin’ In The Pines I fully expected to be trapped under our tent fighting off mosquitoes and fielding questions from customers who would try to talk to me about a subject I knew little about. When I asked on of my coworkers what kind of people we’d meet at the booth, he said: “We’re going to get a whole lot of boring white dudes who are going to talk our ears off about stuff we don’t care about,”. That didn’t help my enthusiasm as I already was afraid that I’d be out of my comfort zone. My girlfriend and another co-workers told me to buck up and go to the show with a positive attitude so I put my big boy Event Liaison pants on. It turned into a fantastic experience, of which I won’t soon forget. 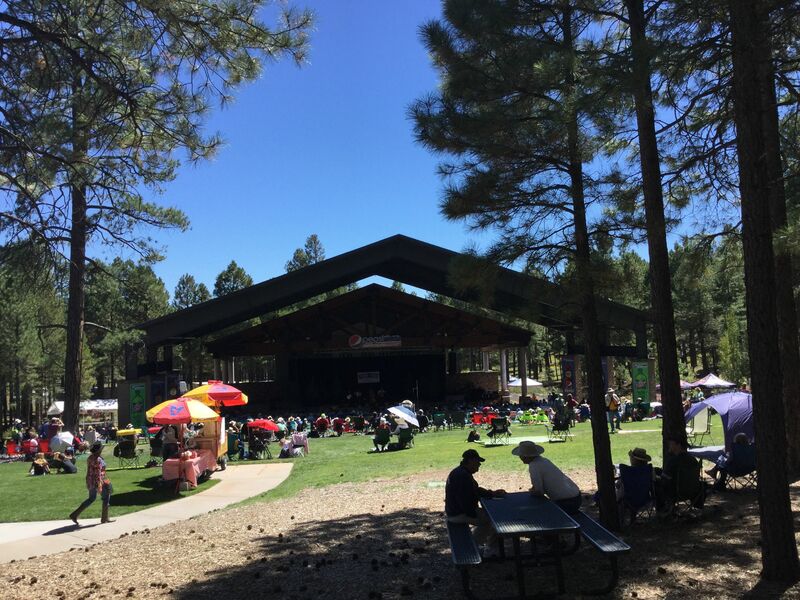 On the first day, my Supervisor Katie Spratt and I headed over to the event with the Donivan, the Flagstaff store Music Manager and we arrived at 10am to whole lot of enthusiastic fans at the gates of the amphitheater. 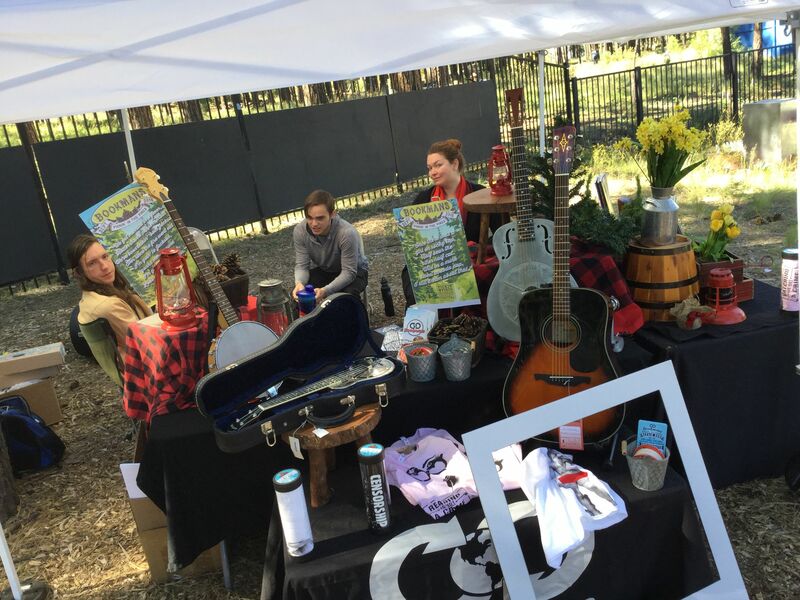 Our two cars were jam packed with a tent, tables, decorations, instruments, and all sorts of swag like t-shirts, coozies, and stickers. We unloaded our items near the entrance to the amphitheater where at least 50 early-birds were lined up to enter the gate. We had to navigate skillfully through the mass and after a few trips, we set up our tent and table on a lovely hillock that overlooked the grounds of the amphitheater with a good sightline of the event. With our prominent white tent and two fold-out tables, we laid out rustic decorations all over. There were faux baby pine trees, boxes and baskets. We put out our best Bookmans swag over the front. In addition, we had a lovely steel resonator guitar made by National who also made the unique resonator ukelele on the other side of the table. Both instruments were a good draw for the discriminating musicians and fans who were perusing the various tents. The bands that played rocked (or picked?) the stage and left people feeling festive and with a groove in their soul. Here’s a link to the lineup on all three days: http://pickininthepines.org/main-stage-schedule/. Suffice to say that there was over 20 bands without a weak act among them. The highlights of the show were two groups that really touched upon the different aspects of the current bluegrass scene. There were the Earls of Leicester, a traditional old-school bluegrass sextet from Memphis who just tore up the stage with their virtuoso performance and rollicking great music. With traditional guitar, banjo string bass, mandolin, fiddle and Jerry Douglas on the dobro, the wowed the crowd. They were dressed to the nines in their cowboy hats and black suits replete with string ties. The other group that caught me attention was the oddly monikered Hogslop String Band made up of five good old boys that looked like they stepped right out of an Appalachian hoedown. With two fiddle players, a banjo player, a washtub bass player and an acoustic guitarist, the quintet had the energy of a punk band and the chops of a top-notch square dance group. Hogslop String Band were as high-energy and raucous as they get and the Pines’ crowd didn’t seem to know how to get in the fiery bluegrass groove. Even if not all the audience got them, Hogslop would never be forgotten. The fun continued over the next Saturday as the attendance at Pickin’ increased and the energy of the amphitheater grounds rose. The excellent and varied bluegrass bands and some solo performances continued during the day. Over the next two days, there continued to be many fine bands that just kept the positive energy flowing throughout Fort Tuthill. The vibe was great all over the event as people just seemed to be illuminated by all the great bluegrass. 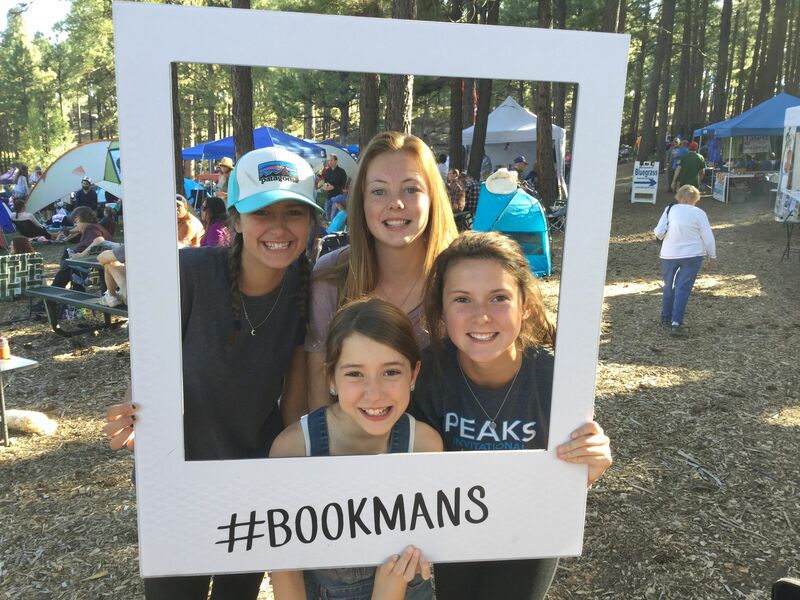 We continued to greet all sorts of customers from different parts of the country who had never heard of Bookmans and we gave away our swell swag. It’s hard to show people exactly how great our store is without them actually experiencing the magic but we did our best to give out some store coupons as we attempted to convey the awesomeness of Bookmans. Katie and one of our other employees Adam were over to the kids activity area and helped the kids create recycled ukeleles out of boxes, rubber bands and pens. The activity was a big hit on both Saturday and Sunday and plenty of the kids swung by the booth to show off their sweet ukes. I loved that there were so many kids at Pickin’ who were really having a grand time with the music and activities. By the end of Sunday, we were tired but very happy and all of us had a great time. In spite of my silly reservations, I loved the entire weekend and all the music and wonderful people. I was sad that it all had to come to an end but I was more than ready to prep for next year Pickin’ In The Pines. By next year, I’ll also be much more familiar with bluegrass and I might even be trying out a banjo.